Would the first successful manned moon landing have run as smoothly as it did if mission control wasn't properly stocked with strong coffee? Probably not, claims a new campaign for the Colombia Coffee Grower's Federation. 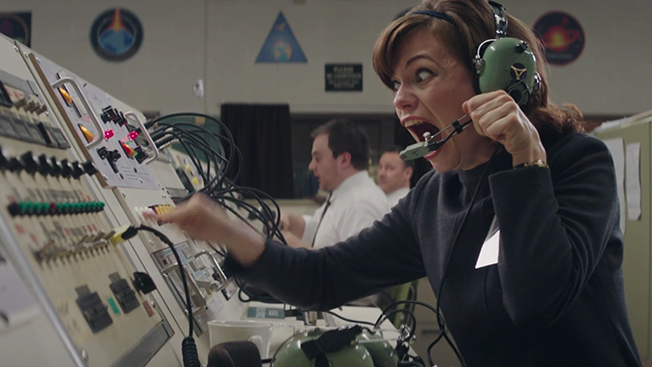 In agency Rokkan's first campaign for the trade group's consumer-facing brand, Café de Colombia, we open in Houston, Texas, as NASA's beleaguered crew prepares for the storied liftoff of Apollo 11. The space-themed campaign, which launches on the 47th anniversary of the first manned moon landing, suggests that in every big moment in the world's history, something special was brewing,and that something was probably a cup of Colombian coffee taste-tested, handpicked and inspected to ensure its greatness. Or it was all thanks to Francis—the guy who makes sure break room No. 3 is always stocked with the delicious coffee. You go, Francis! "From cold brew to fair trade to latte art, our culture is more obsessed with coffee than ever. But people don't realize the most important step to making a good cup of coffee is starting with a great bean," Emily Garvey, director, strategy at Rokkan, told Adweek. "We wanted to help today's coffee enthusiasts, someone who values quality above all, realize the bean's power in a way that was relevant and entertaining." The "Greatness is Brewing" campaign includes the long form "Liftoff" spot and three 15-second ads, all focused on some of the qualities that make Colombian coffee so great. All spots are designed to get more U.S. millennial consumers interested in 100 percent Colombian coffee. The campaign will include a push on Facebook and Instagram as well. "With this campaign, we want new coffee drinkers to have a better understanding of the superior qualities that come from Colombian coffee beans, how they are selectively picked, inspected for quality and taste," Roberto Vélez, CEO of the Colombia Coffee Growers Federation, said in a statement. "We want them to look for Colombian coffee in their favorite coffee shop or in the grocery store nearby. We want them to know that 'Greatness is Brewing.'"